Some consider Chiller to be the most gratuitously violent video game released to that point—it is the only game to have been permanently banned in the UK. The gameplay includes shooting (among other targets) the appendages of living people who are bound and chained in a dungeon setting. The graphics depict flesh being ripped off in chunks. A player's goal is to shoot everything that there is on the screen, both animated characters (ghosts, zombies, humans) and inanimate elements of the background. There are four unique screens detailing various horror scenarios and settings, a torture chamber, a rack room, a hallway, and a cemetery. For each screen, shooting all available targets gives the player a bonus shooting round. The game features a Ghost counter on-screen scoring system named the "Ectoplasmic Tabulator". It has very similar gameplay to "Crossbow" and other related Exidy 440 board system games. 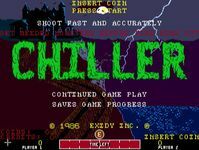 Source: Wikipedia, "Chiller (video game)", available under the CC-BY-SA License.